Live2Lead is right around the corner on Friday, October 12th – has your team bought their tickets yet? This year’s conference includes an incredible lineup of renowned leadership experts including John C. Maxwell, Debra Searle, Daniel Pink and Carly Fiorina. Named the “Most Powerful Woman in Business,” you may recognize Fiorina from the 2016 Republican primary ballot or from her tenure as CEO of Hewlett-Packard. Read on to learn more about her achievements and her current leadership strides as the chairman of two international philanthropic organizations. Fiorina started her career at the very bottom: as a secretary for a nine-person real estate firm Marcus & Millichap. With strong work ethic and natural leadership skills, she was soon promoted from secretary to a real estate broker. With the experience of leading a small company under her belt and an inspired passion for the world of business, Fiorina went back to school and earned a Masters of Business Administration from the University of Maryland. In 1980, at age 25, Carly Fiorina joined AT&T as a management trainee – one of the only women on her team. By 1985, Fiorina was a District Manager at AT&T, overseeing AT&T’s largest civilian government account, the General Services Administration (GSA). She continued to climb the corporate ladder and shattered the glass ceiling at AT&T, becoming the company’s Vice President of Strategy and Marketing – the company’s first female officer. From there, Fiorina was promoted once more, becoming the Head of North American Field Operations. In 1995, AT&T spun off its telecommunications equipment business into a new company, called Lucent Technologies. Fiorina was a natural fit to lead the effort as Lucent’s Executive Vice President of Corporate Operations. Under Carly Fiorina’s leadership, Lucent’s initial public offering (IPO) was, at the time, the largest IPO in U.S. history. By the end of 1996, Lucent had created tens of thousands of new jobs and the stock price had nearly doubled. In 1998, FORTUNE Magazine named Carly Fiorina the “Most Powerful Woman in Business” for the first time – due to her incredible success at Lucent. She would continue to be on the list for the next six years. In 1999, Fiorina became the first woman to lead a FORTUNE 20 company, as the CEO of Hewlett-Packard. While HP was a Silicon Valley icon, through decades of mismanagement it had turned into a broken, bloated bureaucracy that was falling behind its competitors. Fiorina rebuilt HP, shaking up the status quo and saving tens of thousands of jobs, shaping her into a transformational leader. Her choices weren’t always the most popular ones, but ultimately her decisions were the ones that saved the company. 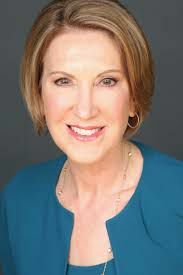 After leaving HP, Fiorina headed the newly founded External Advisory Board for the Central Intelligence Agency under President George W. Bush. With her experience at fixing broken bureaucracies at HP, the federal government knew Carly had the insight and experience to bring more transparency and accountability to the CIA. With Fiorina’s background in business, she had never before held an elected office. In May 2015, Fiorina announced her campaign for President, with priorities to better implement technology in the federal government and to improve the budgeting process at the federal level. She won the first two Republican debates, however ultimately suspended her campaign after failing to finish in the top five during the Iowa caucus and New Hampshire primary. Carly Fiorina served as the Chairman of Good360 (the world’s largest philanthropic organization) and the Chairman of Opportunity International (a Christian-based organization that lifts millions out of poverty around the globe through micro-finance). She now serves as the Founder and Chairman of Unlocking Potential – an organization with the core leadership philosophy that leaders are made, not born; that everyone has far more potential than they realize; and that people living closest to the problems are best positioned to solve them. Through an intensive, hands-on experience and supported experimentation and implementation, Unlocking Potential provides an opportunity for anyone (not just those with a certain title or position) to develop the behaviors, characteristics, tools and disciplines to become a leader and maximize the impact of their work in their communities. Want to learn from Carly Fiorina live? Join us on Friday, October 12th for Live2Lead, a half day leadership development conference simulcasted live in West Des Moines. Bring your team to learn from world-class leadership experts, and be prepared to implement a new action plan and start leading when you get back to the office with renewed passion and commitment. Enjoy the company of other local leaders as you learn together and inspire one another to add value to your community. Get your tickets here.